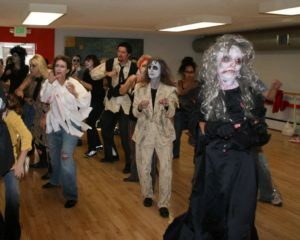 DeWinter Marketing & PR develops massive thriller zombie dance event with 250 dancers to help launch a new dance studio. The owner of a new dance studio needed to skyrocket her studio into big awareness FAST. She opened the studio in a time of economic downturn, and had heavy competition from more established dance studios. She was looking for a way to put the new dance studio on the map fast, bring traffic through the door, and develop a roster of students. Right around the time the studio opened, Michael Jackson died unexpectedly. 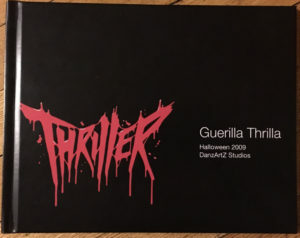 After this happened, DeWinter Marketing & PR Agency President Courtney DeWinter (also a dancer) suggested that the studio owner organize & teach the choreography from the group zombie dance in “Thriller” into 4 manageable chunks as part of a company launch event. Agency Principal Courtney DeWinter set up a strategic partnership with the Downtown Denver Partnership (DDP). DDP agreed to help promote the event so the dancers would have a great crowd to cheer them on. Local, nearby bistros, restaurants, and bars were notified of what was coming, so they could prepare signature Thriller drinks and food promotions, and accommodate the crowds. Once the TV station’s morning show coverage was done, the phone started ringing and did not stop for 2 months. People were calling and begging to be let into classes, so more classes were offered. 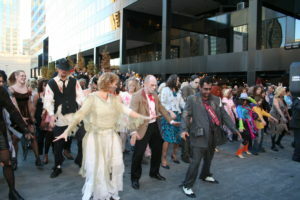 Amateur dancers of all ages, from age 8 to age 73, attended dance classes to learn the Thriller zombie dance in four, one-hour sessions. A hard-cover, print-on-demand memento book with photos of the dancers training, and the actual performance for those who wanted to purchase it. Once the logistics were in good shape, Courtney DeWinter provided more pre-performance publicity, with media advisories reminding local media about the event, the time, the date, the location, and the scope of the event. 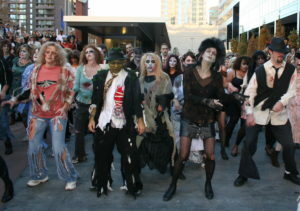 On Halloween night 2009, more 250 costumed zombie dancers of all ages trained by the studio gathered at Skyline Park in downtown Denver and performed the group zombie dance from “Thriller” in front of hundreds of cheering onlookers plus TV crews. This launch event brought 250 people through the studio in 2 months flat, and the dance studio netted close to $10,000 in revenue in the first 2 months of operation. The studio instantly became known in the market very fast because of the extensive media coverage. Not only was this event tremendously successful from a business perspective; it touched people and gave them an unforgettable experience. Following the event, amateur dancers who had participated tearfully said the experience was one of the coolest things they’d ever done, and that they would never forget it. To see the powerful effects of this company launch event, please visit the YouTube link: http://www.youtube.com/watch?v=UHZKOLPx6x4 There’s a long intro so please fast forward to 1 minute 15 seconds for the start of the actual performance. 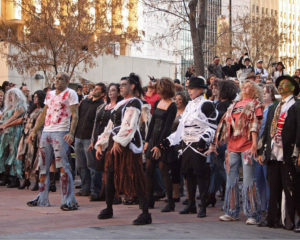 Please watch the whole video to see the hundreds of “zombies” that performed, plus the hundreds of screaming, appreciative people who came out to see this performance. When launching a new company, product, or service, a launch event can be a powerful and effective tool to achieving awareness, and generate leads and new customers.